The Tyrant's Grasp Player's Guide has been Loosed from its Prison! The free Tyrant's Grasp Player's Guide is now available! Troubled times lie ahead for the nation of Lastwall, and the root of these troubles lies in the small frontier town of Roslar's Coffer. A handful of heroes are caught up in these dire events, inadvertent bearers of legendary power destined to save or doom the world. Lastwall is known for its valiant paladins, pious clerics and warpriests, and brave fighters. Yet many other types of characters—including resourceful rangers, cunning rogues, powerful wizards, and canny inquisitors—are appropriate for the Tyrant's Grasp Adventure Path. This player's guide contains plenty of spoiler-free advice to prepare characters for the challenges to come. In addition to character advice, this player's guide contains information on the nation of Lastwall and the town of Roslar's Coffer. 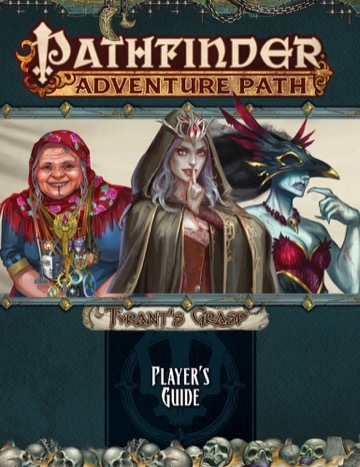 Several campaign traits round out the player's guide, each providing a strong connection to the frontier town, but useful wherever the heroes' adventures lead! Embrace your destiny to curtail the rise of undeath and evil! Download the Tyrant's Grasp Player's Guide today! Woo Hoo! I got something to hunker down and read while this crappy weather continues! Thanks Paizo! The Outsider trait is my personal favorite. I'm looking forward to running this AP when my group gets done with Carrion Crown. Book 1 can't get here fast enough, though. So this felt shorter than other recent player's guides (3 less than Strange Aeons, and 7 less than Ruins of Azlant, for example). I want to underline that I am not complaining about a free product, I'm just curious- is this because this is an AP where a GM will be wanting to hold a lot of their cards close to their vest? Since I want to play this one, but probably won't get to it for at least a year. So if this is one where "the players know as little as necessary" is a benefit, I'll have to be careful. I really need to finish off my Carrion Crown campaign. We were about to start the final chapter when my extensive re-writes and customisation was lost in a hard drive incident, which left me not only unable to progress until I'd redone it all again, but pretty demoralised with *wanting* to do it again. I'm guessing it is since the description for the first module mentions a starting scenario that's only vaguely alluded to in the guide via the comment about not having a familiar or animal companion at the start. We don't have any subsystems to present in this one, for one thing. For another, it doesn't really provide an advantage to describe Roslar's Coffer in much more detail, for reasons that become clear in the second adventure (called, I note, "Eulogy for Roslar's Coffer"). I also noticed there wasn't a "want to learn more" sidebar. Is that because there isn't much out there already on Lastwall outside of the ISWG or was that to save a page? Kind of interested to see how the PC's are going to match steel and sorcery against a mythic level Lich, especially since I have no idea whether this is going to be a mythic level adventure or not. Prophet of Kalistrade is listed as a good choice for prestige class, eh? Me likey. Just spitballing here, but I think it's extremely unlikely that the PCs face off against Tar-Baphon himself or leave him utterly defeated at the end. I think one of the reasons for this AP is to leave a "here be monsters" existential threat to the rest of Avistan region in this approximate part of the world to replace the Worldwound, which will be canonically shut in PF2. A more likely endgame would be the PCs denying the Whispering Way their "weapon of mass destruction" which is alluded to here. But I think we have confirmation that this isn't going to be mythic. So with you losing access to your familiars for the entire first book, what is a witch/shaman supposed to do? Not having a "companion" certainly hurts other classes but you need the familiar to regain spells. Is there anything in the book that solves this issue or is it just nearly impossible to play a witch/shaman for the first book? Since it's just "familiars" and "animal companions" who don't go on your deadventure, and spiritualists are specifically called out as a good choice, I have to imagine you can take your phantom or your eidolon with you. So I wonder if a figment familiar (obviously no help to witches) or an elemental whispers familiar would work too. I absolutely love that this is a Survival Horror campagin- that's so cool! Wow, this one actually arrived pretty fast. I mean any time there's a threat of this magnitude, there needs to be some contrivance why this particular group of low level people are the ones to solve it, instead of sounding the alarm for all the high level people in the setting don't come and fix it (I mean, people's WotR parties could probably show Tar-Baphon a bad time.) In this case it seems likely that the PCs will end up the only people who are immune to the teased "superweapon" that the Whispering Way has. But the "can't take it with you" probably has something to do with "nothing you aren't literally wearing" (and perhaps not even that) goes with you on the first adventure. So I guess if you're going to play a Witch, there are a few archetypes which do not have a familiar, but the Shaman might be in trouble. Alternatively the time we are without access to a familiar or Animal Companion is not the first book but the first adventure in the book. So you might get your familiar back at level 2 or so. How about you folks wait for the adventure to come out before losing your peanuts? Umm, rude man :D I mean the player's guide straight up says "You won't have access to familiars or animal companions until second book, so it might be really hard to play classes that need them in first book", isn't it okay to be confused based on what the player's guide actually says? No, it's unfair to form an opinion on a product from what is essentially an advertisement meant to inform your opinion on that product. Obviously. Well, for starters, the adventure might say "your familiar is gone, but if you're a witch/shaman, here's how you can regain your spells". But you won't know until it comes out or a dev comments on how that's being handled. Can confirm, you are all blowing this way out of proportion. Like I'd have thought animals would get to come with you on the boneyard adventure, that is the part I'm surprised by since I didn't think there is any reason for that to not be possible. In which case the player's guide will have provided misleading information. This has happened in the past - Reign of Winter's player's guide advises players to make wintry characters even though there is little non-meta reason to do so and even though the initial chapter of the AP presumes wintry weather is unusual for the clime and season; Hell's Rebels's player's guide informs players that the "Silver Ravens" are an active organization - but it represents a failure of the player's guide to do what it's supposed to do. It should hardly be presumed that the player's guide for any given campaign provides misinformation. That would defeat the purpose of the player's guide, which, again, is to act as an advertisement for the AP. So we presume instead that the player's guide is not misrepresenting the AP, and use the player's guide to make predictions about the AP. And this particular player's guide raises some questions. I agree with TriOmegaZero that this is a molehill rather than a mountain, but nevertheless, it is a molehill rather than perfectly level ground. Isn't "get excited and speculate over a nugget dropped by the player's guide" an appropriate topic of discussion for the player's guide thread anyway? It doesn't say how large a fraction of the first book this is for; since you start out in the town, presumably you start with these companions, and then are separated from them later. Even so, it would kind of hose most Witches and Shamans, and a few weird archetypes of other things that have spell storage Familiars. I also noticed that it doesn't say anything about Bonded Items or other equipment other than that shopping for specialized equipment (such as firearm ammunition) will be very hard, so archetypes that have spell storage Bonded Items instead of Familiars might be okay. I'm very excited for this adventure path! Thanks for having the Player's Guide out so quickly. It's really appreciated. Not impossible. I'll avoid spoilers, but the sidebar on page 6 of the first adventure describes how, generally, the PCs don't have familiars or animal companions. HOWEVER, there are certain exceptions, including a witch's familiar and a shaman's spirit animal. A GM that wants to broaden that exception can do so, but we wanted to set out the expectation in the player's guide. In hindsight, I should have added something about "this doesn't mean you shouldn't play witches and shamans, we've got you covered there." Adam and I were speculating that someone would comment about how early this player's guide is out within the first 5 or 10 posts, but y'all waited until post #16! Perfect that's what I was hoping for, but yeah that probably should have been in the player's guide. With the terrible weather we're having in Washington, thanks for this. I get to just bundle up on my couch and read, instead of trying to shovel out my driveway. LOL! "Your faith is invigorating, and once per day you can lay on hands as a paladin of half your character level (minimum 1)." Does this mean that a character gets 1 use of lay on hands from character level 1st to 7th (1d6), 1 use starting at 8th level (2d6), 1 use starting at 12th level (3d6), 1 use starting at 16th level (4d6), and 1 use at 20th level (5d6)? Am I misreading the sentence? Thanx for your enlightenment and best regards. You can use it once per day. The amount healed does go up though. The PG suggests a reanimated medium as a "potentially useful archetype," but I feel like such a character would run into serious difficulties in Book One. I mean, the character is actually dead! Wouldn't that be a problem in terms of convincing the psychopomps to let them go? Does the adventure cover how this might be handled? From what I understand, the PCs aren't actually dead, they just ended up in the Boneyard because Something Went Wrong(TM) with the superweapon. I feel like any time someone is using the reanimated medium archetype it's because they are working together with the GM to make it work. Normally it has rules issues, which are not insurmountable, so fixing thematic issues should be a lot easier. No, I get that, and it's the problem. The other PCs won't be dead, so they can work their way free of the Boneyard eventually - but the reanimated medium explicitly is dead, and I kind of feel like the psychopomps would not look kindly on such a character, at least in terms of them deciding to go back to the Material and not on to their judgment. One could argue that Pharasma has no issue with reanimated mediums (just like she has no issues with a spiritualist's phantom) because these things are explicitly *not* undead. So we can view their liminal state between death and life to be something that was fated to happen, and Pharasma knows when it's going to end and prefers to let that play out. Like becoming a phantom or a reanimated medium is not something anyone attempts to do (or at least there's no diagetic way to make this happen) it's just a weird random accident that happens to some people. Psychopomps go around harassing people who are trying to cheat the system, less so people who just have the weirdest luck. Or at least that's how I read it. it's not a loose spirit. Plenty of wiggle room there. the drunkard (lawgiver) sheriff must be popular at the bar. Oh got a cut? Well just hang by old sheriff Mary-Lue, sometimes during this night she will lose consciousness.. ..and your bleeding wound will vanish and be as good as new! And as a varisian picking up a made in home renewing reincarnation tattoo somewhere along the line. One of those lil toys that are worldvise overpowered but with a player not so much. Death just stops being much of a problem as you are back in 24 hours (or some such). One more way to extend the notion of traveling, travel in new bodies too and sometimes live in whole new communities for a lifespan. Don't think so because it's not a class feature but a campaign trait. At least, as a GM I wouldn't allow to take it. But the question was if my calculations were correct. From the answers I got I guess I didn't misinterpret the trait. Thanx all for your input. Is the "well guarded stone road" between Roslar's Coffer and (I guess) Castle Everstand guarded by fixed installations at some interval, or regular patrols, or both? I wanted to follow up on this, because, well, 1st level paladins don't get lay on hands. Not a spoiler, really. More often patrols than fortifications, and those with decreasing regularity.